The final production in the Showbiz Christchurch 2017 season opens at the Isaac Theatre Royal on 8 September. Sister Act – A Divine Musical Comedy follows the exploits of 1970s wannabe disco diva Deloris Van Cartier as she escapes from her gangster boyfriend. Having witnessed him commit a murder, she is put in protective custody in the one place the cops are sure she won’t be a found: a convent! Disguised as a nun, Deloris finds herself at odds with the rigid lifestyle of the nuns and their uptight Mother Superior. Using her unique disco moves and singing talent, she inspires the nuns to create a more contemporary choir and they become the hit of the community. Word of their success reaches her ex-boyfriend Curtis, who arrives with his gang to settle the score with Deloris. Sister Act is directed and choreographed by New Zealand Arts Foundation Laureate Sara Brodie who has an extensive list of directorial credits to her name including over eighty productions for theatre companies throughout Australasia. Her last Showbiz Christchurch production was directing Monty Python’s Spamalot in 2015. Musician and composer Matthew Everingham is directing the score of gospel and disco music written by Tony and eight-time Oscar winner, Alan Menken (Aladdin, Beauty and the Beast, The Little Mermaid, Little Shop of Horrors). 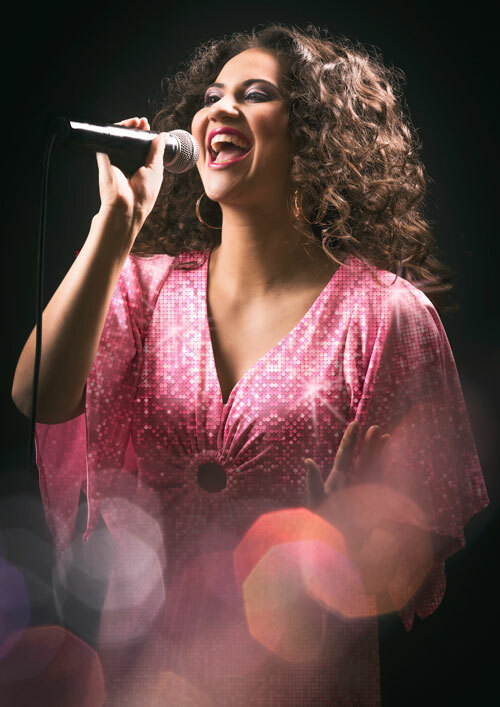 Monique Clementson will play Deloris, the same role she recently performed in Invercargill Musical Theatre’s production of Sister Act. Clementson is a big ‘70s fan who grew up listening to disco hits and counts Sister Act I and II as her favourite movies. Growing up in Nelson, she and her older brother would compete against each other to sing the high notes in the gospel hits that featured in the Sister Act movies. It wasn’t until Clementson attended the National Academy of Singing and Dramatic Art (NASDA) in Christchurch in 2014 that she realised her favourite movies had been turned into a Broadway musical featuring all new original music. Nick Purdie will perform the role of the gangster boyfriend, Curtis Jackson. Purdie played alongside Clementson as Cop and love interest ‘Sweaty’ Eddie in the Invercargill production. Jackson’s gang will be played by Chris Symon (TJ), Blair McHugh (Joey) and Rychalo Thompson (Pablo). Matt McMenamin will perform the role of Eddie. Charlotte Taylor and Greta Casey-Solly will complete Deloris’s cabaret trio in the roles of Michelle and Tina. 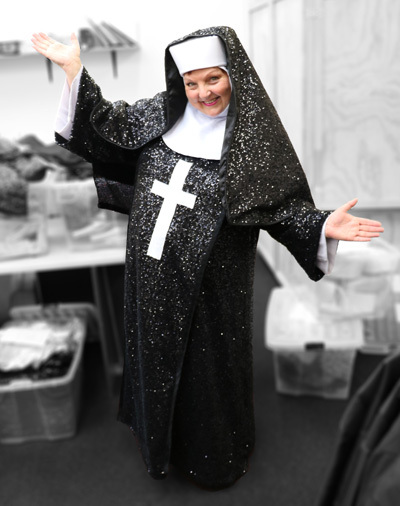 Veteran musical theatre and cabaret entertainer Sarah Greenwood-Buchanan steps back on stage as Mother Superior. Her most recent supporting lead role was as Tanya in the sell-out Showbiz season of Mamma Mia! The principal nuns will feature Hannah Falconer (Sister Mary Robert), Kate Taylor (Sister Mary Patrick), Nickie Wellbourn (Sister Mary Lazarus), Anne-Marie Cotton (Sister Mary Martin of Tours) and Glenda Bailey (Sister Mary Theresa). Ian Lester will play Monsignor O’Hara and Raoul Neave will appear as the Pope. Clementson and Purdie will be joined on-stage by a cast of more than 50 nuns, gangsters, altar boys, singers, dancers and musicians to create a stunning looking and sounding show with all the pizzazz of Broadway. The Showbiz Christchurch production of Sister Act – A Divine Musical Comedy will be at the Isaac Theatre Royal from 8-23 September.